Welcome back to Manicure Monday! Full disclosure, I’m not super happy with these photos, but because I love how this marble turned out, I’m posting it. It’s been raining here for a week straight, and even though I was in the middle of washing dishes, I had to take advantage of a brief moment of sunshine. My nails are wet and flat here, the tips of the nails are all chewed up-looking because I didn’t do a great job trimming, but I’m happy enough with the result to post it. My polishes are Enchanted Polish‘s October 2014 and Blue-Eyed Girl Lacquer‘s Niagara Sunrise. I paired these two because they both have a strong and warm shimmer that complements the other. October 2014 has this lovely olive shift, where Niagara Sunrise’s is a soft but fiery orange. October 2014 also benefits from being a holo. These two have so much dimension on their own, and some of that gets lost in this marble, but I’m happy with how it turned out. I did a dry marble for this. I poured a thin stripe of each polish onto a Ziploc bag, marbled them together with a dotting tool, then let it dry overnight. I tweaked the drip marble method a bit; as cool as drip marbles are, I feel like marbling it with a tool gives me more control over the way the colors mix. By the time I’ve gotten what I want with a drip marble, the colors are so blended together I can’t tell them apart. Enchanted Polishes are sold on their website. Blue-Eyed Girl Lacquers are sold in their online store. This entry was posted in Manicure Monday and tagged black, blue, Blue Eyed Girl Lacquer, dry marble, Enchanted Polish, holo, indie, nail art. dry marbles are so hard for me. I am envious of this one. 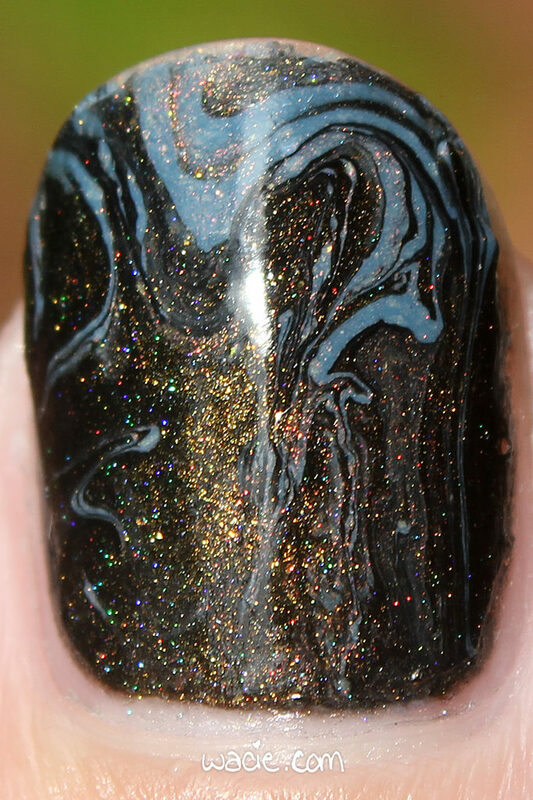 this is a beautiful nail marble!!! This looks like it took forever to do. The colors together are wonderful. This colour combination is fantastic! I still haven’t tried a dry marble, but it will happen one of these days! This is sooo pretty and the pictures are fun! The rain has been super annoying! I finally got to take some flay lays today tho! Beautiful mani. I love both the pairing and the abstract water marble!